I arrived in Chamonix, and settled into my hotel, a very nice place called the Lion D'Or. It was a relatively inexpensive hotel, with a shared bathroom and no TV, but was perfect for my needs. The room was clean and cool, the bed comfortable, there was a friendly german shepherd to pet, and it had a nice balcony overlooking the Rue Paccard, the main street in Chamonix. The next day, I set off to visit the various climbing shops, starting with Snell's. The variety of gear was very good and the prices on the European made stuff was amazing. Prices at about ½ of U.S. prices were pretty much standard. One of the salesmen I spoke to told me that Snell's sold more ice axes than in all of North America. Looking at the lines of people in front of the cash registers, their arms full of climbing equipment, it was not hard to believe. I then headed down to the Maison de Montagnes the headquarters of the Chamonix Guides Company. I spoke with the receptionist there and asked for an English speaking guide to take me up the North Spur of the Aiguille de Chardonnay. Not long afterward, they arranged a meeting with Serge, a pleasant, French guide. We talked a little about the North Spur route on the Chardonnay, about my earlier ice, rock, and alpine experiences, and agreed to meet at the Albert Premier hut the following evening. The next day, I hiked up to the Albert Premier hut. The hike was quite pleasant, particularly because I rode a ski lift for much of the way, and because my pack was light. The hut was large and spacious, with beautiful views of the Chardonnay and the surrounding mountains. I took some pictures, then relaxed on the porch, taking in the sights, sipping a cold soda I had purchased from the hut guardian. There was a group of girls, about high school age, who surprised me by stripping off their shirts and sunbathing on the large deck of the hut. This was definitely not like alpine climbing in the United States. Later that evening, my guide Serge showed up. We ate dinner together at the hut. The food was surprisingly good: soup, some sort of chicken and rice dish, desert, and lots of crusty French bread. We retired early, sleeping in the communal bunks of the hut. We wakened the next morning well before dawn, dressed, and set out by headlamp across the glacier, roped up for safety. We moved quickly, and by the time we arrived at the base of the route, I had to take a few minutes to catch my breath. It was still dark, and we climbed the initial pitches by the light of our headlamps. 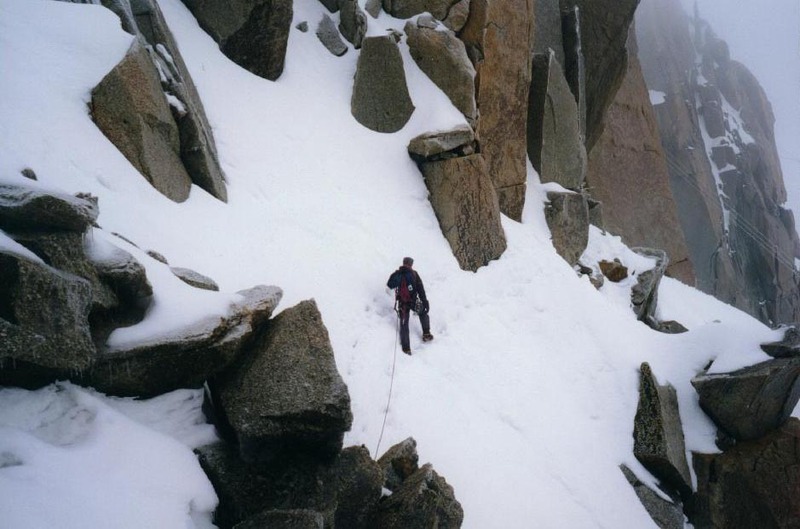 The climbing consisted of snow and ice gullies, interspersed with rock sections. The ice and snow was pretty straight forward, but some of the rock climbing was a bit strange to me, as I had very little experience climbing rock while wearing crampons. Serge never placed any protection. During most of the climbing, we moved together, but on the more difficult sections, he would climb first, then give me a hip belay up. The sun rose as we got to about 1/2 height, and I was treated to truly amazing views of the Alps. The great vistas were accompanied, however, by an increasing sense of exposure, and I became extremely aware of how high up I was getting. I kept moving, however, and the climbing was for the most part pretty straight forward. I received a real jolt of adrenaline when my crampon came off. The lip on the sole of my leather boots wasn't very deep or defined, and the metal crampon bale on my right foot just popped off suddenly while front pointing up an icy section about half way up the mountain. I was in a rather awkward spot at the time, and had to traverse over and up to a small rock outcropping to re-secure my crampon. Serge belayed me from above during this precarious maneuver. I reattached my crampon, pounding the bale with my hammer to conform it more closely to my boot, then we continued up the route. Near the top of the climb, we left the mixed snow and rock of the ridge and moved out onto a featureless slope of snow and ice. Unlike the rocky ridge, which alternated sections of steep ground with ledges and the like, this top section was one continuous sweep of steep snow and ice. The climbing was not difficult. Much of the climbing consisted of kicking shallow steps in hard snow. It was easy for the most part to get good axe placements, either by sinking the shafts into the hard snow, or with solid pick placements in ice. However, we were simulclimbing the entire top section, with no protection or belays, and after a while, the exposure and lack of protection began to really prey on my mind. I found myself getting tense and using a lot more energy than necessary in placing my tools and crampons. The nervous tension brought about by the exposure made the climbing seem much more difficult than it was, and I couldn't keep the thought out of my mind that if either Serge or I fell, that probably both of us would die. I kept the tension under control, but I did keep looking anxiously up, watching the summit creep slowly closer and closer. When I finally reached the top, I draped myself face first over the flattest spot I could find, and let the accumulated tension of the last several hours slowly drain out of my body. After about ten minutes of relaxation, picture taking, and eating an energy bar, it was time for the descent. 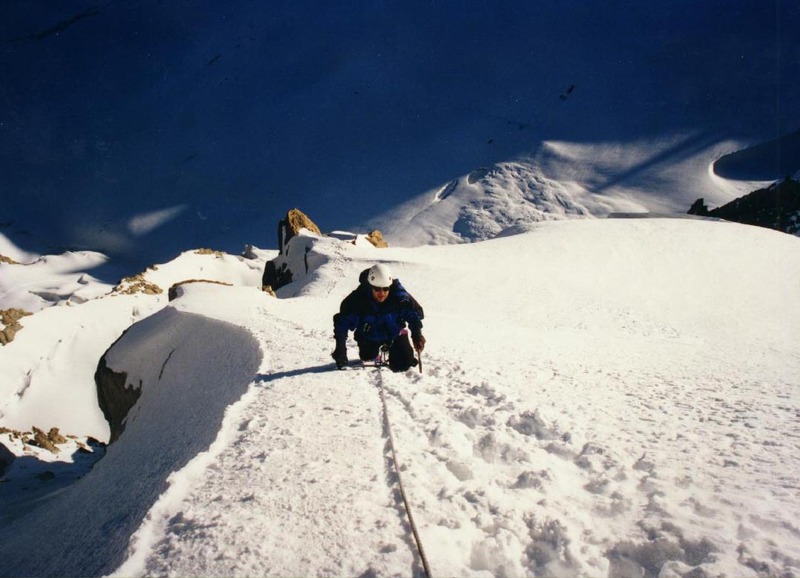 The initial pitches of the descent were quite interesting, traversing a narrow snow covered ridge. What followed was a long, arduous session of downclimbing, working our way down the West ridge of the mountain. The lower section of the descent was glissadable, and we were able to cut some time off of the trip sliding down the hard snow. When we reached the glacier, we began the long trek back to the hut. This time, our route took us across a section of the glacier which was covered with crevasses, some of them pretty big. We belayed each other over several snow bridges. Having only ever experience the relatively tiny glaciers of Wyoming and Colorado, it was a very interesting experience. Serge was meeting another client at the hut, so when we reached the hut, we parted ways and I headed back down to the valley, while he stayed there. By the time I reached my hotel room, I was exhausted, and slept all that night and through much of the next day. When I awoke, the first thing I did was to go out and buy a pair of Scarpa Assault climbing boots, with nice, deep channels for my crampon bales. I was NOT going to have a crampon fall off again while climbing. Then, I contacted a guide that I had met over the internet, an American named Francis who is a professional guide based out of Chamonix. We determined to spend the following day on the Mer du Glace practicing glacier travel and ice climbing techniques, and then spend the night at the Refuge des Cosmiques near the Aiguille du Midi, as a prelude to climbing something as yet to be determined the next day. Our day on the Mer Du Glace was pretty fun even though it rained off and on all day long. We spent our time practicing crampon and climbing techniques. Francis was a good teacher, and I learned quite a bit from him. After our day on the glacier, we headed up to the Aiguille du Midi on the tram, accompanied by a huge number of Japanese tourists. The mountains were engulfed in thick fog, so the tourists unfortunately didn't get any of the spectacular views that the Midi tram ride is famous for. The narrow ridge you have to traverse when descending from the tram station down to the path to the hut was a bit intimidating. I understand that it is well traveled by skiers during the winter, but I can imagine that some skiers crossing it would be quite appalled, particularly if they were used to the tame, groomed slopes found at most American resorts. We traversed down and around to the Cosmiques hut, which we reached in very low visibility conditions, fog, snow and wind. The hut was a comfortable place, with lots of windows and a very open and airy feel. It felt especially snug, as the conditions outside were quite wintery, with wet snow and heavy fog everywhere. With an eye on the weather, Francis and I decided that our best option for tomorrow's climb was the Arete de Cosmiques, a moderate mixed climb back up the ridge to the top of the Aiguille du Midi. We slept in late the next morning, avoiding the crowds headed off to the summit of Mont Blanc, and got a leisurely late morning start on our route. The climbing was a mix of snow, rock and short sections of ice, but mostly snow. The visibility was poor, with fog snow, and gusting wind. The exposure on this climb was not anything near that of the Chardonnay, and the rocky nature of the climb made it easy to offer quite a bit of protection by weaving the rope in and around rock horns while still moving quickly. The climbing was fun and interesting, and involved a lot of rock climbing with my crampons on. I was surprised at how surely my crampon points would grip on small ledges and slot into cracks. The climb ends right at the Midi tram station, and we pulled up over the ladder and onto the observation deck. It was great not to have to deal with any downclimbing, as Chamonix was just a short tram ride away. That night, I had dinner with Francis and his wife at one of the nicer restaurants in Chamonix with a beautiful view of the mountains. We ate Raclette, a traditional meal which consists of a big block of toasted cheese, served tableside with a small charcoal grill, which you scrape off and spread over boiled potatoes, meats and vegetables. It was a pleasant end to a very fun trip. The next day, I packed up and took the bus back to Geneva. It had been a wonderful experience, but I had been away from home for almost three weeks, and was ready to see my family again. I wasn't done climbing in the Alps, however. 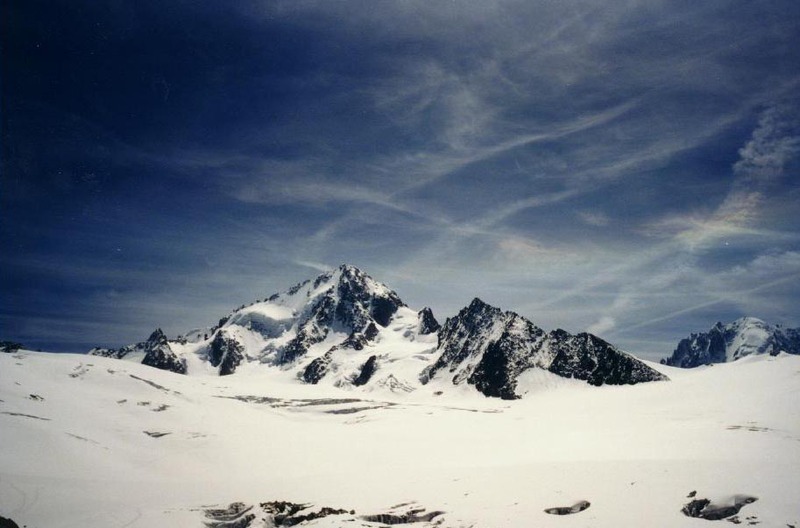 The Kuffner ridge on Mount Maudit had caught my eye, and I was already looking forward to my return to Chamonix.